My first intentional attempt at a session IPA has been in the keg for about a month. A perfect time for a tasting! Original gravity = 1.045, final gravity = 1.015, abv = 3.9%, estimated IBU = 38. The head is white and fairly thin, but still pretty persistent. 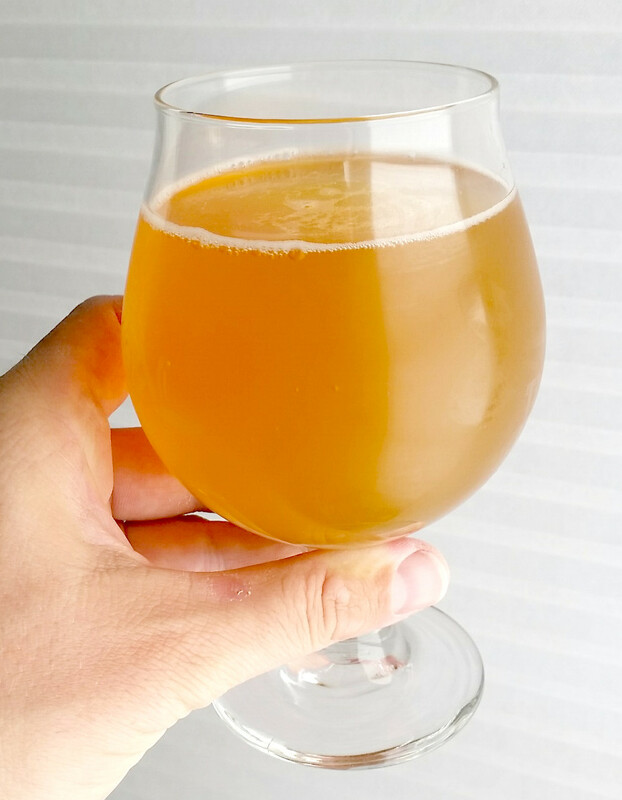 The beer itself is slightly hazy and light gold in color. Quite pretty! Fairly weak, considering that it was dry-hopped for so long. There are slight tropical fruit notes, with perhaps a whiff of citrus. Light and hop-forward, with a pleasant floral and tropical fruit taste; very smooth on the finish. The bitterness is noticeable but restrained; I might up the hops a bit for any future iterations. There is a slight (but not unpleasant), rounded mineral taste at the finish. The malts are very much in the background, perhaps too much so. Pleasant and fine carbonation; the body is adequate but perhaps a touch thin. Yes, but with some modifications. I quite like the concept of session IPAs, which hit all of my buttons (hop-forward, not numbing in alcohol content). Truth be told, I was a little disappointed with Azacca hops. My personal preference for an IPA is to have a big nose punch, and Azacca just isn’t there. It has pleasant aroma and great flavor, but is restrained to the point where it might be better suited for light dry hopping in a blonde or perhaps plain pale ale. Next time, I’m going to try something different from the hops, and perhaps a little more for bittering. I also would like to up the maltiness on this just a touch–a small amount of crystal malt (perhaps crystal 60) might be what I need. Finally, I’m thinking about a little wheat to aid with head formation and retention. All in all, I feel like I’m on the right track with this brew, but have a little work to do to dial it in. This entry was posted in session beer, session IPA, tastings and tagged ASIPA. Bookmark the permalink.